RALEIGH, NC -- A woman who posted a picture of her dog with its mouth taped shut on her Facebook page was found guilty of animal cruelty Friday. 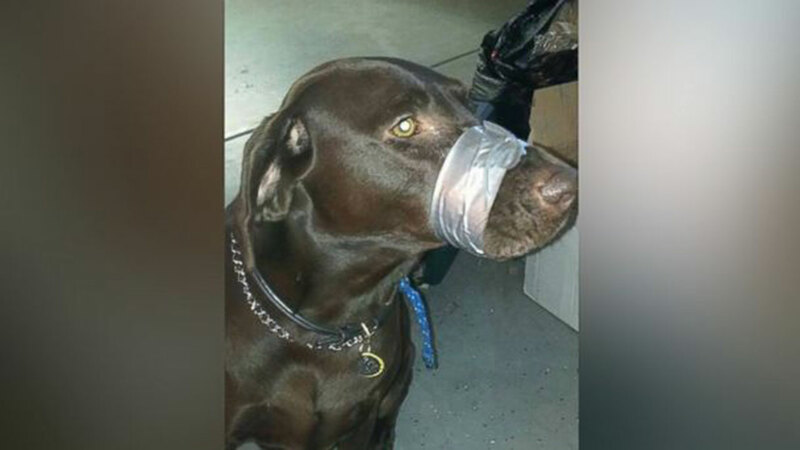 Katharine Lemansky was charged by Cary police in November after a photo of Lemansky's chocolate lab named "Brown" was posted on Facebook with its mouth duct taped shut with the caption, "This is what happens when you dont shut up!!!" Horrified animal lovers saw it and criticized her on social media, which sparked an investigation that spanned three states before she was located in Cary. Police say Lemansky - whose Facebook page lists her name as Katie Brown - was staying in town with her dog when the photo was taken on Nov. 27. In court Friday, Cary Animal Control Supervisor Shelly Smith said Lemansky admitted duct taping the dog's mouth, calling it a joke and saying it was a way to stop barking. She said Lemansky told her she accidentally posted the picture to Facebook, meaning to only send it to her son. When asked if the dog was bothering neighbors, Lemansky said no, and that duct tape was only on the dog for 15-20 seconds. Smith said Lemansky admitted taking the picture in a Cary garage on Churchview Street. Shelly found "Brown" didn't have any hair loss or swelling and was in good spirits so they allowed Lemansky to keep the dog. The prosecutor told the court the punishment caused pain to the dog. Lemansky was sentenced to a year of supervised probation, but the sentence was suspended. She must pay court fees.